Here are some tips on how this site can help you find a new home for your ferret; adopt a great new companion or successfully shop with or support a ferret shelter. This is a Directory of possible resources. The accuracy or dependibilty of registered businesses or individuals is not guaranteed. The public or private shelters and rescue contacts listed here are not accredited, inspected or endorsed by the Ferret Shelters Directory, The Ferret Association of Connecticut, Support Our Shelters, the Ferret Coalition, or any other sponsors or collaborators. Before surrendering your pet, adopting or supporting a facility, research the organization, individual or business. Here are some suggestions for places were you can gain further information or begin to gain better insight into an organization or individual. Do not use the listings for Medical Emergencies! 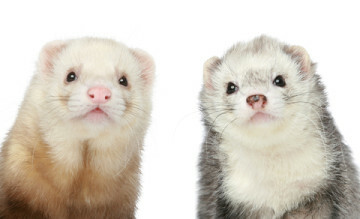 If you have a ferret health care emergency, contact a veterinarian! Some shelters may be able to provide vet referrals, but depending upon the shelter, it may take up to several days for a reply. Small, volunteer organizations do not operate the same as a multi-million dollar regional spca. Animal control facilities – hours, policies, and adoption/give-up procedures – differ from town to town. Be patient and understanding of limitations. Ask about open hours or visitation options, especially for shelters that are based in a private home. Small shelter operators usually have fulltime jobs outside their shelter work. Do not turn up on their doorstep if the facility after hours or without an appointment if the listing indicates that is how they operate. If you are purchasing items or services from a listed business, follow the same care as making any online purchase. We cannot verify the accuracy of any claims or offers. Shop a Ferret Shelter links are provided as a service to help support shelters. The Directory cannot authenticate products and services offered. It is not the purpose of this site to rate or rank shelters. Any issues or problems with the services provided by a shelter should be handled directly with the shelter or, in the event of serious issues, with local authorities. Should you see a problem you feel we should be aware of, please let us know through the Contact Us form. We cannot promise action on your behalf. However, repeated reports or serious complaints will monitored. Please Contact Us with any feedback about the directory or changes that you feel should be made. As this site was developed by volunteers and operates on a “shoestring” budget, please accept our apologies if all the “bells and whistles” available to commercial enterprises are not available on this site. The people involved in the development of this site are either shelter operators or volunteers. Funds go to animal care first. Thank you for your understanding. 1) Select the US Zip or AU Post Code Box to find a rescue in a specific zip/postal code (probably zero results unless you know the shelter's code). 3) Use the Location Box for a drop-down menu by country, province, state. If this site helped you, please consider a gift to help keep it operating. Donations made through this link go 100% to the support this site. Funds are managed by the Ferret Association of CT, a 501(c)3 US charitable organization. All donations are acknowledged.